The Selmer TS44 Tenor Saxophone features a fully ribbed body construction, Pisoni pro leather pads with metal resonators, blued steel springs and hand engraving. 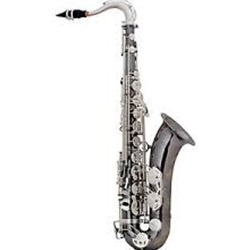 The TS44 also comes with a neck designed and manufactured by Selmer Paris for this instrument, as well as a mouthpiece from Selmer Paris specially made for the advancing player. This makes the TS44 is the most unique instrument in its class and price range, and the only one that can boast a genuine Henri Selmer Paris neck and mouthpiece. FEATURES The TS44 is also available as: TS44B - Black Nickel/Silver Plate Keys and Neck TS44M - Brushed matte finish with clear laquer neck TS44UL - Unlacquered finish with silver plate neck TS44S - Silver PlateFREE SHIPPING with your purchase today!